Chromite is a brownish-black mineral consisting of a ferrous chromic oxide in cubic crystalline form, occurring principally in basic igneous rocks: the only commercial source of chromium and its compounds. It is an oxide mineral composed of chromium, iron and oxygen (FeCr2O4). Magnesium can substitute for iron in variable amounts as it forms a solid solution with magnesiochromite (MgCr2O4); substitution of aluminium occurs leading to hercynite (FeAl2O4). In its natural form it occurs in solid solution with other minerals in the spinel group, so chrome contents are less than the theoretical 68%. The most important use of chrome is in production of high-strength alloys and alloys which are heat, abrasion, corrosion and oxidation resistant. Approximately half of all chromite production goes into the manufacture of stainless steel. Chromium chemicals are used for many purposes; pigments, photography and plating being but a few. 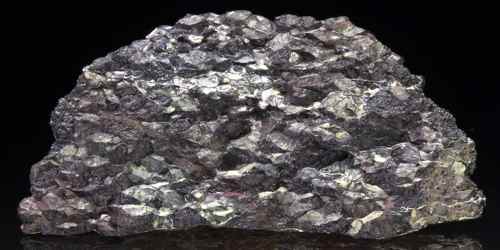 Chromite is used as a refractory in the production of steel, copper, glass and cement. 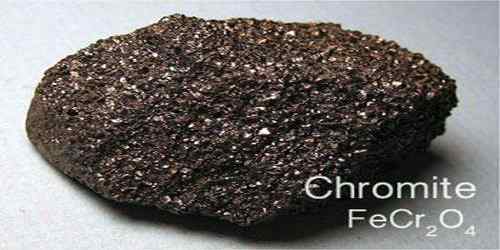 Chromite occurs as a primary accessory mineral in basic and ultrabasic igneous rocks. Economic deposits form by crystallisation of chromite from a cooling magma, resulting in large stratiform deposits or smaller pod-like deposits. 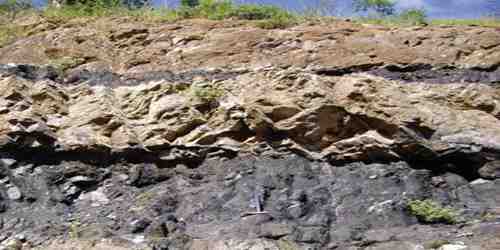 The most significant occur in large, layered, igneous intrusions in shield areas older than 1.9 billion years. The largest and best known of these is the Bushveld Complex (Republic of South Africa), which extends over 12 000 km2 and contains 60% of the world’s known chromite reserves. The word mine production of chromite is about 26 Mt (2013) with South Africa (42%), Kazakhstan (15%) and India (15%) the major producer’s in addition recycling accounts for about 50% of consumption. Australia’s only significant chromite deposit, Coobina, is a straitform deposits in the Pilbara region of Western Australia, with a possible resource of 1.5 Mt at 29.4% Cr. The mine produced 452 000t of chromium in 2012. Chromite can be challenging to identify. Several properties must be considered to differentiate it from other metallic ores. Hand specimen identification of chromite requires a consideration of: color, specific gravity, luster, and a characteristic brown streak. Chromite is sometimes slightly magnetic. This can cause it to be confused with magnetite. Chromite and ilmenite have very similar properties. Careful observations of hardness, streak, and specific gravity are required to distinguish these minerals in hand specimens. Chromite is the mineral ore of the metal Chromium, and the chromium must often be extracted from the ore and purified before it is used. Chromium is an important ingredient in steel; it gives this metal increased hardness and toughness, and it helps it reduce chemical erosion over time. 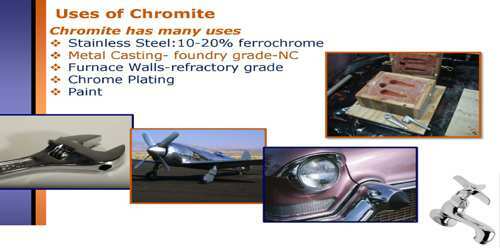 Chromium is also vital in the aerospace industry because it is used to anodize the aluminum that is used to build aircraft and related equipment. Most of the time, economic geology names chromite the whole chromite-magnesiochromite series: FeCr2O4, (Fe,Mg)Cr2O4, (Mg,Fe)Cr2O4 and MgCr2O4. The two main products of chromite refining are ferrochromium and metallic chromium; for those products the ore smelter process differs considerably. Several chromium compounds are used as dyes and colorants. Lead chromate is used to make the pigment chrome yellow. Tiny amounts of chromium from chromite ore combine with various other compounds to give rubies their red color and emeralds their green color. Various chromium pigments are used to give cosmetics their colors as well.